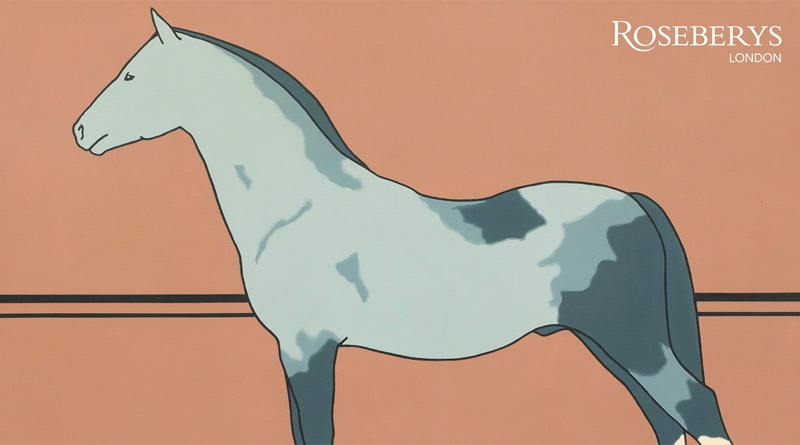 Patrick Caulfield’s 1964 “Pony” is going up for auction next month. The oil on board work is 122 x 152.5cm. A stripped back equestrian image simply titled “Pony” is expected to fetch up to nearly $NZ1 million at auction next month. The 1964 oil on board work by British artist Patrick Caulfield goes under the hammer at Rosebery’s auction house in London on September 26. Its pre-sale estimate is between £300,000 and £500,000. “Pony” is being offered for sale for the first time on the open market since its original purchase from the artist in 1964. At the time it was painted a broad revolution in the art world was taking place with the emergence of the Pop Art scene, but this piece is a personal revolution for the artist. Caulfield did not categorise himself in that genre, viewing himself as a formal painter using simple objects from everyday life to create timeless views often tainted with a subtle amount of irony. Where Pop Art focused on the throwaway culture of consumerism, Caulfield was looking to challenge himself and the viewer by presenting often traditional, romanticised subject matter that many other modern artists of the time shied away from. It could in fact be argued the stylised line, bold colours and flattened surface areas in his works are almost the only crossover between Pop Art and his work. Caulfield studied at the Chelsea School of Art, and then at the Royal College of Art, where his contemporaries included David Hockney, Allen Jones and Ronald Brooks Kitaj. While these artists were looking at consumerism and the future, Caulfield was more interested in referencing art history, tradition and structure. On initial inspection ‘Pony’, which is painted on board in household oil-based paint, may appear to be a painting which can be commonly associated with the mannerisms of the Pop Movement, on closer inspection is a painting laced with historical reference and elegant structure. The work is a pared-down depiction of a horse – at first glance without obvious historical references or context. On closer inspection though, it can be interpreted as a camouflaged reference towards 18th and 19th century equestrian paintings – especially the works of George Stubbs. Caulfield is quoted as being interested in this subject because “the Englishman’s favourite paintings are of horses”. The bold horizontal lines in the background echo the position of the horizon often seen in such paintings. However, in stark contrast to the silken stallions in Stubbs work, “Pony” is a masterclass in stripping back the shape and form of the horse and unlike his contemporaries who were working with spray paint, rollers and stencils Caulfield chose the traditional tool of the brush and painstakingly painted the surface to achieve a flattened image. Detail from Patrick Caulfield’s “Pony”. Perhaps more interesting than the subject matter is the distinct reference in this piece to the Minoan frescoes in Knossos, Crete. Caulfield visited Greece twice before this painting was produced, with this in mind it becomes immediately apparent that the dusty pinks, minimal lines, flattened forms and decorative black bar framing the work drawer direct influences from the Throne Room in the Minoan ruins. Pony was on loan to the Tate Gallery in 1981 for inclusion in the artist’s first major retrospective entitled 48 Paintings from 1963-81, and was also included in the artist’s third retrospective exhibition in 1999 comprising 55 paintings from the years 1961-97 at The Hayward Gallery. Apart from these public appearances, the painting has remained in the same family’s possession since 1964.